I enjoy reading, and I do a lot of it - about half a dozen books each week, mostly fiction, all from our local city and county library branches. Like many, I bemoan the disintegration of our infrastructures and the general incompetence and inefficiency of government, but I have to admit that here we have great library systems. Thursdays are the weekly errand days for my wife and me, and our stops always include the county library branch, which has the largest selection of books and allows them to be taken for 4 weeks, and the city branch, which lets us take movie DVDs for 2 weeks (I know: "Who even uses DVDs any more?..." - but they get new release movies just a couple months after they're at the theaters, and we still use the DVD player). I always have 40 or more titles on reserve at each library, just waiting to be activated. The county library even has free interlibrary loans, so that if they do not have a particular book in their system, they'll search other systems countrywide, and if they find the book they'll get it for me. And if they can't find it anywhere, they send me nice email note apologizing but saying they tried. But what got me thinking about all of this was a book I just got through the interlibrary loan system from Shelby, Montana, which on the inside of its cover has a checkout sheet for handwritten due dates! Living in a relatively large city makes me forget sometimes that other places sometimes still do things the old-fashioned way. When the kids were small we used to regularly head up to the neighbourhood library with a wagon - we'd pull the kids in the wagon to the library and they'd pull the wagon load of books they'd selected back home from the library. Happy days. Before we'd head out on summer holiday we'd load up with books for the long drive and books on CD as well - a favourite memory was listening to the Lemony Snicket Series of Unfortunate Events The Hostile Hospital read by Tim Curry. Fun. I use my local library pretty frequently, and our younger daughter does too. We're a little ways away from it, so it has to be a planned trip. I miss the days when we lived a short walk from the library. When I lived in central Ohio, I had access to a superb public library system and, of course, the Ohio State University libraries (which were amazing!). I miss those days. The library here is nice, but can't compare to the Ohio libraries. It's the thing I miss most about not being in college anymore. I have to remind myself that I no longer have the time to scour library catalogues and shelves like I used to when I was single and in college. When I was a kid my sisters and I would go on some Saturdays to a downtown used bookstore called Acres of Books - and literally was that. Room after room of floor to ceiling of dusty used books, with little organization or sorting in some areas. I was always able to find a few paperbacks to buy with my hard-earned allowance money. (These were the days before video games.) And years later, when I lived on a nearby island here, I worked as the manager (meaning only employee) of a small bookstore. I took the ferry once a month to the wholesalers in Seattle to buy stock for the store, so of course I also bought books that I wanted to read, even if nobody else was likely to buy them. On cold rainy winter days, with virtually no customers coming in, I could sit by the pot-bellied stove in the store and doze off while reading. I have always lived in large cities and all had, and have, fine library systems. It was my father who gave me my love of reading and, when I was a child, every Friday after dinner, Dad and I walked to our local branch of the Brooklyn Public Library where I always chose a few books to take home. Later, in high school, I worked at one of the local branches and was allowed to keep books that the staff was ready to send to be taken out of circulation because they were no longer in good condition. It was a wonderful way to get books that I otherwise could not have afforded. 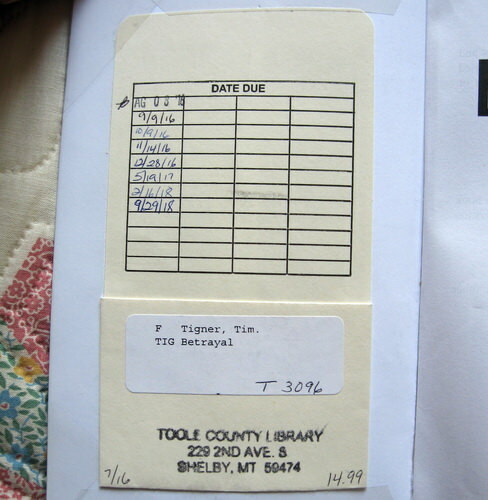 churchilllafemme, while the checkout dates weren’t hand written, even back then, there was still a library pocket in the back of the book where the date of return would be rubber stamped. Though the way books may be checked out has changed and modernized over the years, I’m just thankful there are still books to be checked out. When I was in High School I worked at the local public library. They would rubber stamp the date but then they would run your library card and the card from the book through the machine to photograph it. I remember there was a lady that worked there that had the job of going through the film to identify who had checked out the overdue books. She just sat in this dark room looking at film all day long. Things have changed. I've always been a bookworm, and growing up in the 50s and 60s, I loved the New York Public Library system. Its branches were scattered all over the five boroughs, but the mass transit system was cheap at the time, and that made getting around easy. (And for the younger especially, the getting around was its own adventure of sorts.) In early 20th century the NYPL, together with an excellent and accessible system of higher education, provided the doors through which my immigrant ancestors walked to inconceivably better lives. (09-18-2018, 05:32 AM)HighSpeed Wrote: I've always been a bookworm, and growing up in the 50s and 60s, I loved the New York Public Library system. Its branches were scattered all over the five boroughs, but the mass transit system was cheap at the time, and that made getting around easy. (And for the younger especially, the getting around was its own adventure of sorts.) In early 20th century the NYPL, together with an excellent and accessible system of higher education, provided the doors through which my immigrant ancestors walked to inconceivably better lives. Mike, you bring back great memories for me. I grew up at the same time as you and it is almost as if I had written your post. However, if memory serves, the New York Public Library served Staten Island, the Bronx, and Manhattan. The Queensborough Public Library served Queens, and the Brooklyn Public Library served my hometown of Brooklyn. Anyone from any borough could get any or all three library cards for free as long as he or she was a New York City resident and I had cards for all three, though it was the Brooklyn and New York City ones I used the most. While not as big, the Brooklyn Public Library’s main branch was built in the 1930s and was a modern eye opener. Both the frontage of the Brooklyn main branch and the lions in front of the New York City main branch remain vivid in my mind though it has been more than 50 years since I called that part of the world home. Thanks for the memory. I imagine you are correct Freddy - Lord knows my memory needs work - but I do remember going to different boroughs and taking out books, and I remember being awestruck by the Main Branch. To be precise though, I am not sure I ever got to a Staten Island branch, although I did ride the Ferry at times, and it was fun. These days, on the rare occasions when we drive up the NJ Tnpk to visit relatives, we sometimes spot the rotting hull of an old ferry lying in the mud, and I wonder if it is one of them I "sailed" on. 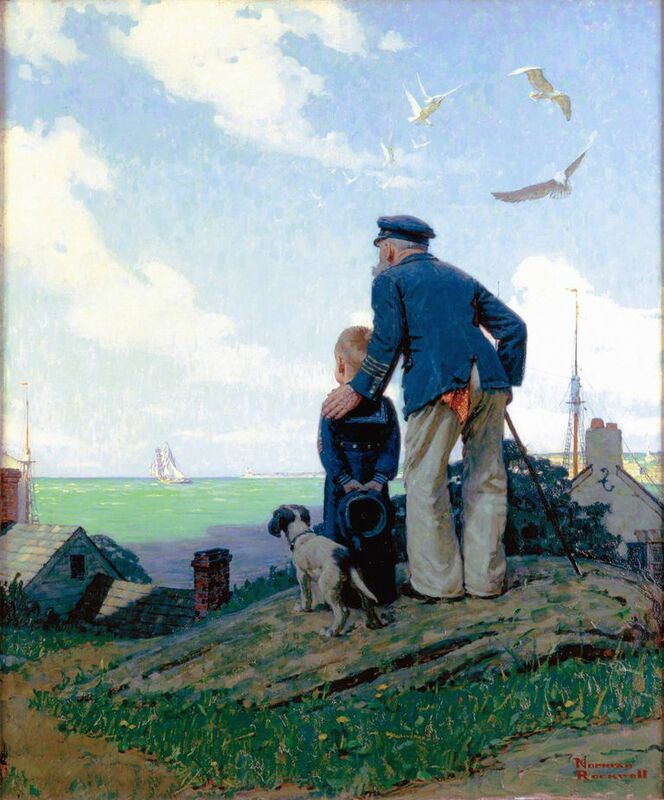 Excuse me for straying off point, but as long as we are walking down memory lane, I thought I'd post this picture that Norman Rockwell painted of me ( ), first as that kid on the ferry and then today. I count myself lucky to be among the kids who could go to a library and see pictures like that. Thanks for that HighSpeed thats impressive. If Martians were to land on earth they'd have to look no further that that reading room as evidence of the importance of reading to Humans. Take that iPhone! !